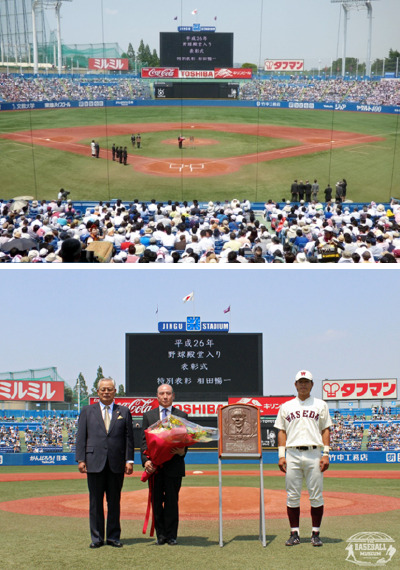 The venue and the game on Sunday, May 31, 2014 were most fitting to honor the great benefactor of student baseball in Japan; i.e. the final matches of Tokyo Big-6 League’s spring tournament between Waseda and Keio with the championship on the line. Katsuhiko Kumazaki (72), President of the Baseball Hall of Fame and Museum as well as Commissioner of Nippon Professional Baseball, presented a relief (see photo) to Nobumasa Aida, son, under the gaze of 33,000 fans with both teams form up in front of the dugouts. As a student business manager of Waseda Baseball Club, Aida organized the “last” Waseda-Keio game in October, 1943 during the World War II when baseball was banned as enemy sport. Although many college students and athletes did not return from the War, Aida, had stockpiled 300 dozens of balls, 300 bats and other equipment before being drafted to military service. The stockpiles subsequently benefited Waseda and the other Tokyo Big-6 baseball clubs to restart their activities after the War. Hall of famers in Japan now numbers 184.